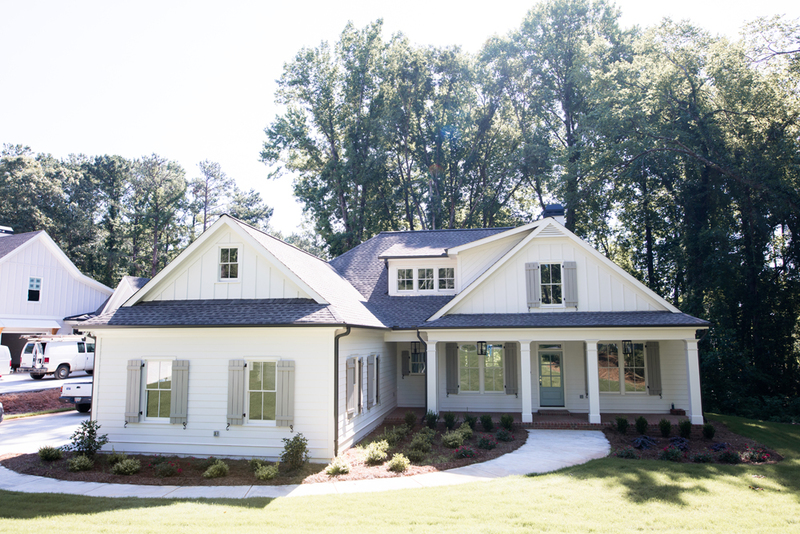 My Dad has great taste so he had already chosen a lot of the exterior and interior finishes, but he doesn’t love the minutia of picking out the details so that’s where I came in. ;) We decided to go grey with the shutters and garage door (can’t remember which color!!) and to stain the korbels over the garage for some variation and dimension. 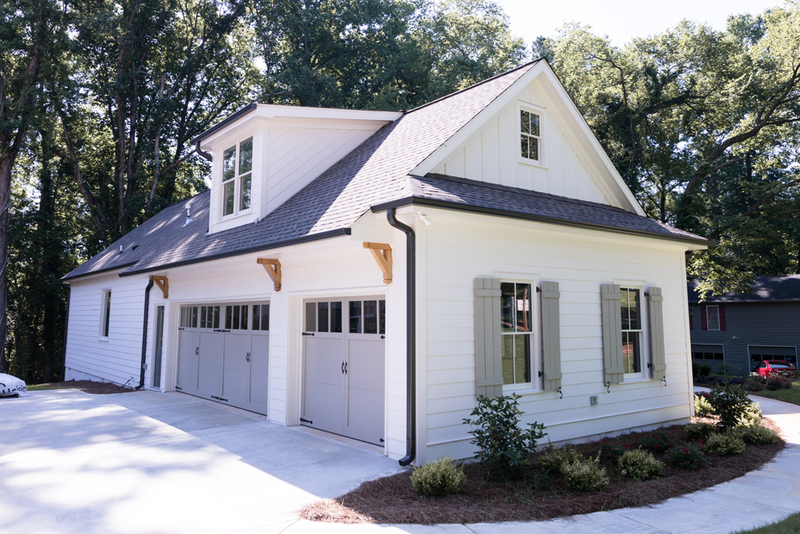 The garage is a dream, right?! In keeping with the southern plan we went blue on the porch ceilings and front door. Found the door color here and then went 1/2 the color for the ceiling. Lights for the porch (these are huge and amazing!) and the flushmount over the door allows visitors to enter without hitting their head. Absolutely love the back porch. So serene and quiet! The kitchen is always the star, isn’t it?! 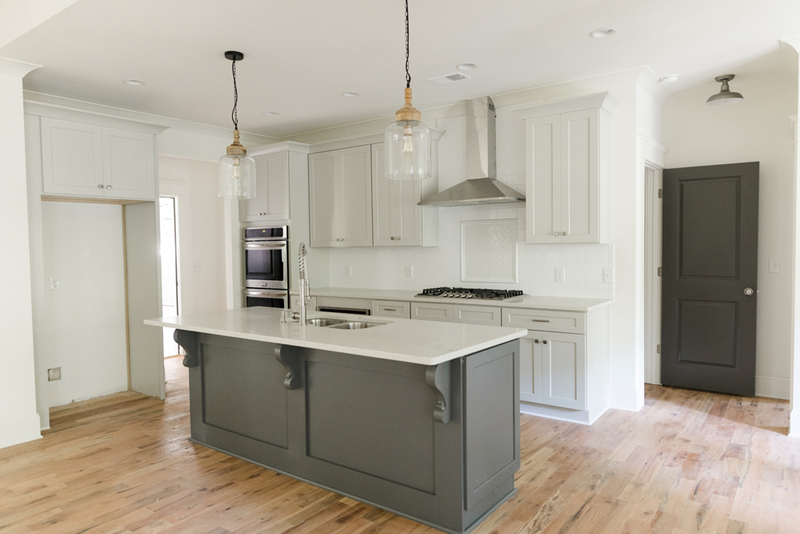 These are prefab cabinets in “Dove Grey” and “Dark Grey.” I love the contrast with the island. We went with a carrara quartz for durability and looks! The tile is subway with a subway herringbone backsplash behind the range. We used a clear poly on both the floors and beams. These light fixtures are so pretty. Found them here. When working with an open floor plan, I always try to mix up the light fixtures or they can compete with each other. I usually go for a mix of ceiling lights, pendants, chandeliers and usually NO fans but I loved the clean lines on this one and it works because there are also can lights. I love this big open space, the ship lap and the shelves. Such a great room with tons of windows. Fan found here. We also ordered a rod extender because of the high ceilings. Love that the dining room is a part of the entry. Such a great space to be with family and friends and to see people coming and going. Those are the highlights!! Thanks for following along on Instagram and hope this helps you if you are building or renovating.